Some of the very best commercial artists of the early 20th century were called in to draw distinctive dust jackets and illustrations for Don Marquis’s books. E.W. Kemble, who illustrated Mark Twain’s “Adventures of Huckleberry Finn” and many of Joel Chandler Harris’s Uncle Remus books, also did the cover and inside artwork for Don’s first book, “Danny’s Own Story,” in 1912. Tony Sarg did the cover and inside art for “Prefaces” and “Noah an’ Jonah an’ Cap’n John Smith,” and John Held Jr. did a cover for “The Old Soak” as well as illustrations for several of Don’s feature pieces in The Sun. Click on the photo above to open an enlarged image of George Herriman’s masterpiece. And enjoy. 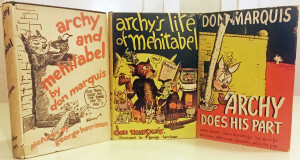 The back story: Herriman’s covers were not the first to appear on two of the three Archy books. 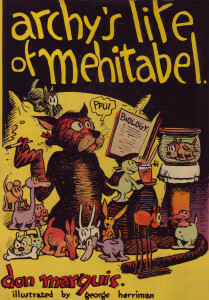 The first edition of “archy and mehitabel” appeared in 1927 with a stunning, minimalist cover by an artist identified only as “J.W.” It was replaced, for one printing only, with 20 thumbnail-size Herriman cartoons in 1930, before a full-size Herriman illustration was put on the cover, also in 1930. It shows Mehitabel in a garbage can, eating a sardine, while Archy types furiously on a small typewriter. This dust jacket appeared from 1930 to 1943 before it was replaced with another Herriman drawing. 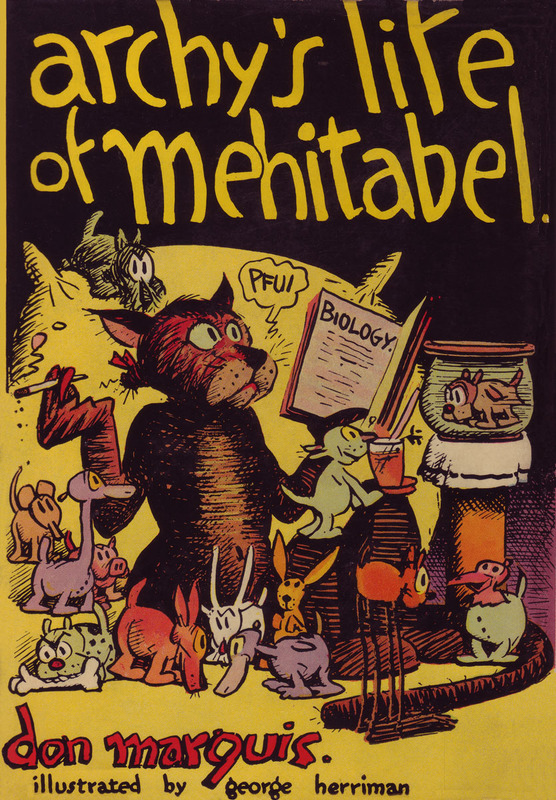 The first-edition cover of “archys life of mehitabel,” in 1933, had a drawing of Mehitabel by the artist “Jay.” It was replaced later that year by the cover above. The final book in the trilogy, “archy does his part,” in 1935, was the only one to have an Herriman drawing on the cover from the first edition through the last (the fourth printing, in 1936). It shows Mehitabel peering through a brick wall at Archy, clearly both at home in Coconino County. Photos of all the covers will be coming soon.